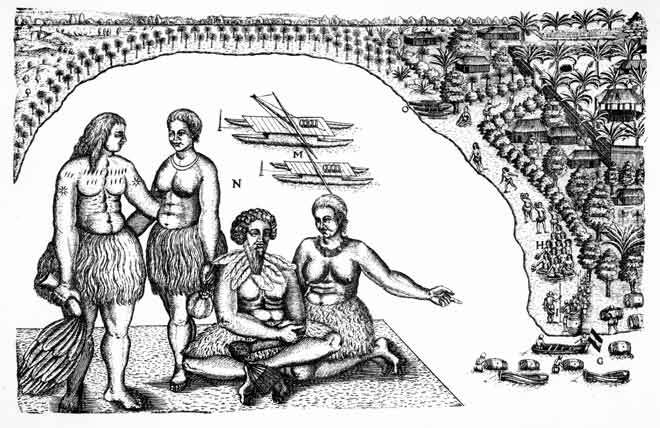 Isaac Gilsemans drew this image while accompanying the Dutch explorer Abel Tasman on his voyage through the Tongan islands in 1643. Two ocean-going double-hulled canoes, called tongiaki, are moored with their masts and sails lowered. Tongiaki were less manoeuvrable but more stable than the flotilla of fishing outriggers shown grouped around Tasman’s ships. Tasman readily recognised these double-hulled canoes from descriptions given by the Dutch voyagers Willem Cornelis Schouten and Jacob Le Maire, who had in 1616 encountered such a vessel in the open ocean between Tonga and Samoa. The largest double-hulled canoe was based on a Fijian design and built in Samoa, and could carry between 500 and 600 people.